"Call me an idealist. I thought, maybe, I bring action and goodness to my heart no matter what the cause. Maybe, I considered my 'shining moment' from the chips are down. Maybe, optimism reigns supreme. Maybe, even a little ray of consciousness will prevail. Maybe." You see, at the age of 27, I suffered a massive stroke due to the result of a blood clot from my heart to my brain. I was in a coma for over a week, barely alive. Because I was so young, I had not one, not two, but three neurologist round ­the ­clock trying to save my life. However, all three doctors were mystify due to the fact that my brain was starting to grow larger so much that it was interfering with my skull. In other words, I was running out of time. Number three: with lots, and lots, and lots of speech therapy, I would retain about 50% of my communication from now until the end of time. Now back in the present, I look at all of the accomplishments, triumphs and tribulations since my accident and I am so delighted and so thankful that I don't even know where to start. I guess in some senses, it’s mind over matter when my catastrophe hit. And it's funny, because when I look at other people even today, they don't know that I suffered my stroke. Other people are not concerned about my global aphasia, a language disorder that affects the processing between my brain and my communication. 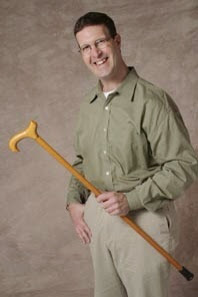 Other people just look at me and realize that I walk with a cane. That's it. And that, was the key to my success. In particular, we can construct the capability of achieving anything we want, any purpose that is meaningful, anything objective imaginable if one can try and succeed. The energy to make everything possible is all up to the individual to be better than you were before. Be disciplined. Be positive. Be unique. Be different. Retired after over 28 years as a sales professional, these days, my passion and focus lies in blogging, networking, mentoring, volunteering and social media. Also, I advance public education and support services to assist people with aphasia ("What is Aphasia?") and their families. As a guest speaker, I share my personal stories and leveraging the power of positive thinking. Drawing from years of personal experience, I teach others how to harness the power of positive thinking and how to nurture and bolster a "can­do" attitude. I have been featured in numerous articles, as well as on radio and TV, including a story on CNN, “Laughter is a Healing Tool”. Originally, as Rotary president and member for 17 years, presently, I am a board member of the Kiwanis Club of Greater Kennesaw with my specialty in membership and designing and maintaining our website. An alum of the University of Chicago, I was selected to serve as the Volunteer RegionalCoordinator for 2013­-2014. Also, in coordination with the admissions department, I interview prospective students who want to attend the U of C.
I founded and was the first president of the Business Network International (BNI Profit Makers), a referrals networking organization. In that aspect, our club was one of the largest members in the United States with over $3 million in referrals in our first year. As an Advisory Council board member for the National Aphasia Association, a nonprofit organization, I promote public education and support services to assist people with aphasia and their families. Additionally, I completed three certificates in information technology, 12 years later after my stroke. In conclusion, my point is not to brag about my feats, but to raise a point that you, and only you can grab your abilities and thrive if you are positive, focused and flexible. Be adaptive to both your surroundings and belief about what you want to accomplish. Don't be frightened or upset, don't be frustrated or blue, but instead focus your attention on how you can achieve great proficiencies with enthusiasm and passion.